Start your Railcar fades and wears thread! We would love to see some fades and wear pictures! One easy free way to host your pictures to post here is www.photobucket.com Just copy the picture's URL in between the . 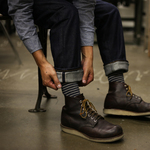 Start your own Railcar fades and wears thread!